Kansas Secretary of State Kris Kobach on Thursday announced his bid to become governor of Kansas in the 2018 election. 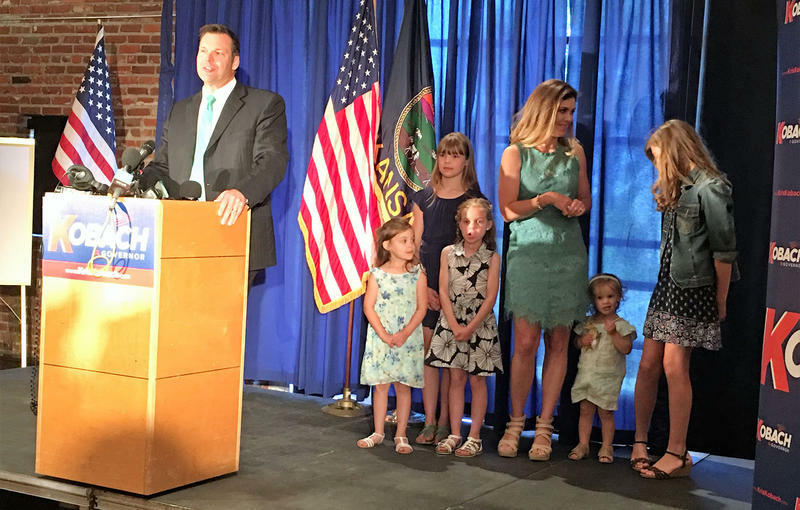 He was joined at his announcement in Lenexa by his wife and five daughters. Kansas Secretary of State Kris Kobach, who catapulted to national prominence on the strength of his anti-immigration views, announced his candidacy for Kansas governor Thursday. Kobach made the announcement two days after Kansas lawmakers voted to override Gov. Sam Brownback’s veto of a tax package that would raise $1.2 billion over the next two years — a rejection of Brownback’s signature 2012 tax cuts. 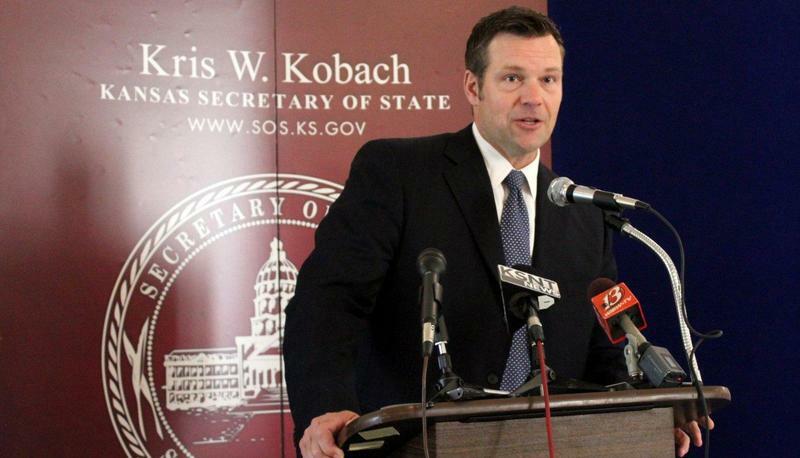 Kobach denounced the vote and said Kansas had a spending problem, not a revenue problem. Although he didn’t mention Brownback by name, he in effect aligned himself with the governor by categorically rejecting tax increases to patch the state’s budget hole, estimated at $900 million over the next two years. “When I am governor, I will fight against every attempt to raise taxes on the people of Kansas,” he said. Kobach, a Republican, announced his candidacy for the 2018 election in the Thompson Barn in Lenexa, an event space on the old Lackman-Thompson estate. A throng of reporters, photographers and Kobach supporters crammed into the space as Kobach spoke for nearly 30 minutes. In his speech, Kobach said “illegal aliens” were costing Kansas $424 million a year. That information apparently came from the Federation for American Immigration Reform, which the Southern Poverty Law Center has said has ties to white supremacist groups. Kobach, who is in his second term as Kansas secretary of state, said that as governor he would put an end to so-called sanctuary counties in the state. He also said that under a Kobach administration, students lacking immigration status would not be allowed to pay in-state tuition at Kansas Board of Regents schools. Last fall, 668 such students were enrolled in Kansas universities and community colleges, according a regents report. That represents 0.37 percent of the total student population in the state, with most of those students studying at community colleges. Kobach also said he would ensure that state and local law enforcement officers cooperate with U.S. Immigration and Customs Enforcement when it makes requests to hand over undocumented immigrants. Kobach has been a polarizing figure in Kansas, where he has used the secretary of state’s office as a platform to launch himself into national politics. He has successfully pushed for tighter voter registration and voter ID requirements in Kansas. He says the rules have helped secure Kansas elections, but his critics say the requirements block legal voters and exaggerate the issue of voter fraud. He has stood by Trump’s claim that millions of people voted illegally in the 2016 presidential election, although no evidence has emerged to support that claim. Trump, in turn, has cited Kobach as a source for his claim of widespread voter fraud. Kobach has served as an informal adviser to Trump on immigration. At several points he was mentioned as being in line for a position with the administration. On Thursday, Kobach spoke of Trump leading an economic recovery and said Kansas needed to be part of that recovery. A popular and frequent guest on conservative media outlets, Kobach has had a sometimes contentious relationship with journalists. On KCUR’s Statehouse Blend Kansas in August 2015, he was asked why people rarely see letters supporting his policies in local newspapers. In his Thursday announcement speech, Kobach said that as governor, he would reduce the number of government employees by leaving positions vacated by retiring baby boomers unfilled. He said he had reduced the number of employees in the secretary of state’s office by 18 percent without diminishing its ability to carry out its work. Kansas has the third-highest number of government employees per capita in the country, he said. “We’re going to see a reduction by attrition, not massive layoffs, but we will try to get by with fewer employees. And something tells me that if 47 of the other states can do it, I think we can probably manage in Kansas, too,” Kobach said. Kobach also said he would put limits on lobbyists and seek to enact term limits for all elected officials. He noted that Kansas Senate Minority Leader Anthony Hensley was elected to the Legislature when Kobach was 8 years old and Gerald Ford was president. Kobach is seeking to succeed Brownback, who has some of the lowest voter approval ratings of any governor in the country and is term limited. 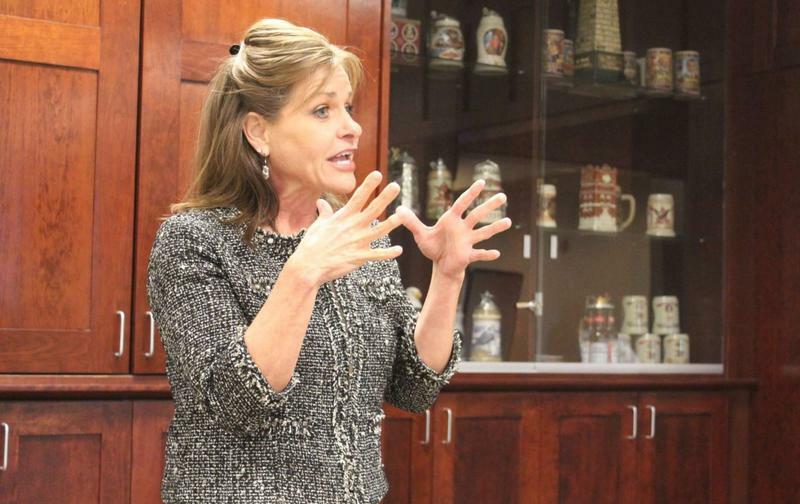 Talk that Brownback may leave the office to take a position with the Trump administration has circulated in the Capitol, but so far no announcements have been forthcoming. Before he was elected secretary of state in 2010, Kobach was an Overland Park city councilman and chairman of the Kansas Republican Party. He ran unsuccessfully for Kansas’ 3rd congressional district in 2004, when he was defeated by the Democratic incumbent, Dennis Moore. He earned his undergraduate degree at Harvard University, holds master’s and doctoral degrees from the University of Oxford and received his law degree from Yale Law School. From 1996 until his election as secretary of state, he taught constitutional law and other law courses at the University of Missouri-Kansas City School of Law. Former state Rep. Ed O’Malley and Wichita businessman Wink Hartman have launched exploratory campaigns for the GOP nomination. 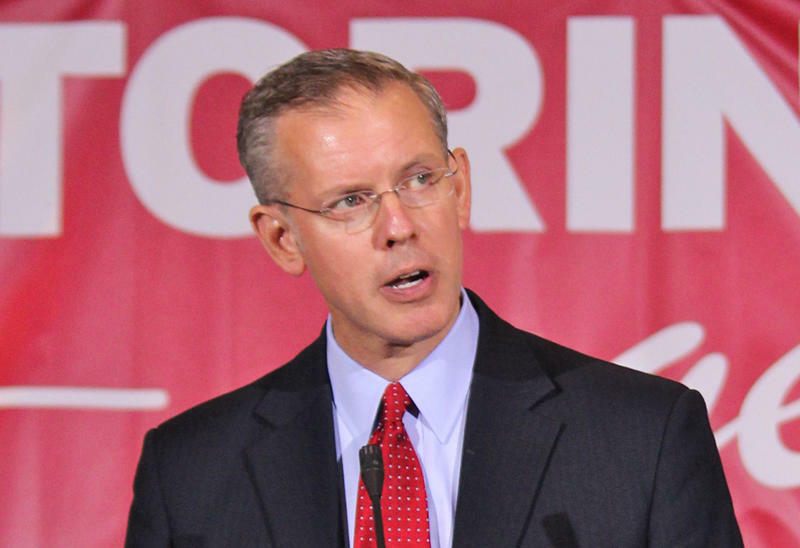 O’Malley represented a Johnson County legislative district for two terms before leaving the Legislature in 2006 to serve as president of the Wichita-based Kansas Leadership Center. Former Kansas Sen. Jim Barnett, who lost to former Democratic Gov. Kathleen Sebelius in 2006, is also considering a return to gubernatorial politics. On the Democratic side of the ballot, former Wichita Mayor Carl Brewer and former Kansas Rep. Josh Svaty have launched bids for their party’s nomination. 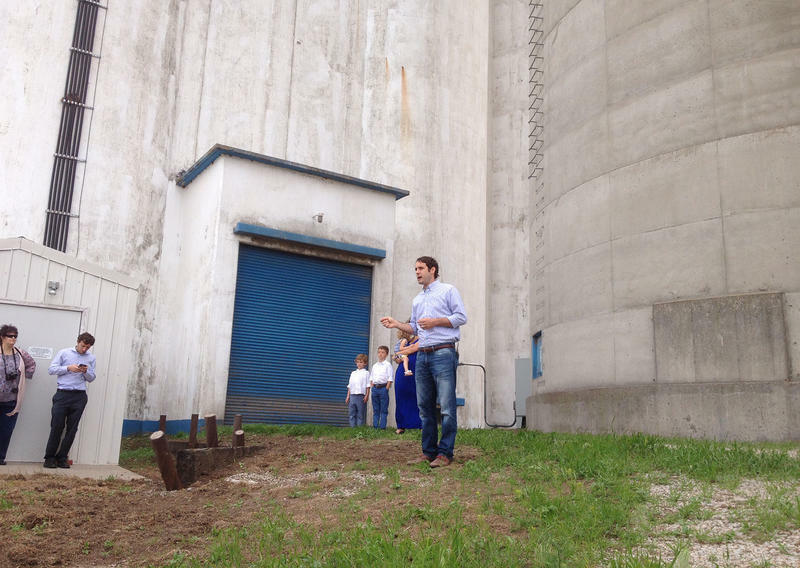 Greg Orman, the Johnson County businessman who in 2014 mounted a strong challenge to U.S. Sen. Pat Roberts as an independent, is also looking at the 2018 governor’s race. Kansas Secretary of State Kris Kobach joins Statehouse Blend to discuss voter fraud, immigration, and his treatment in the media.